Soozier Fitness Power Tower Review - Sooz, or Lose? Soozier Fitness Power Tower Review – Sooz or Lose? To Sooz or not to Sooz? That’s probably the question you are asking yourself at the moment. Well, we’re here to help you find the answer! Now that’s out of the way, let’s get into the detailed review. 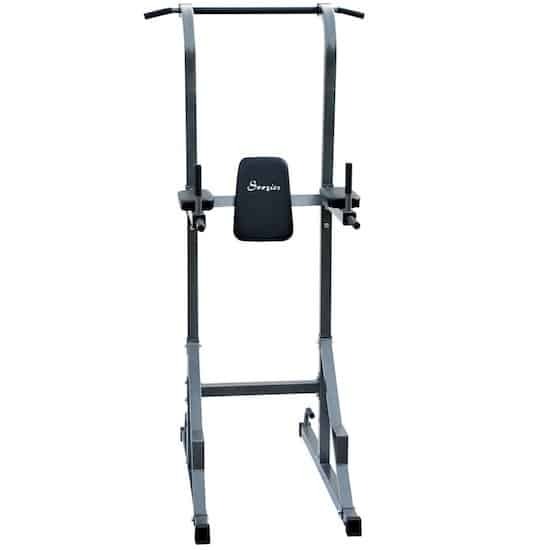 Soozier Fitness make a few power towers: this one is their ‘entry level’ machine, and it seems that they’re really going for a strong, sturdy, and compact piece of equipment. This is one of the smaller power towers in it’s price range, sporting a footprint of approximately 25 inches wide (2 ft; 63.5 cm), 54 inches long (4’6 ft; 137 cm) and 82 inches tall (6’10 ft; 208 cm). Now that’s a compact power tower, and if you’ve only got a small home workout space then this may be what you’re after. However, as we’ll explain soon, its smaller frame also comes with some problems. The pull up bar will allow you to do both pull ups and chin ups, all of which will mainly work your latissimus dorsi (lats) and biceps and to a lesser extent your trapezius, posterior deltoids, abdominals, and pectoralis muscles (pecs). The bar allows you to vary the width of your grip between wide and narrow, which will change the extent to which each muscle is worked (for example, wide grip pull ups work the lower part of the lats more intensely than narrow grip pull ups). You can also use the pull up bar to do hanging leg raises, although the lower height of the Soozier’s bar will make this exercise more difficult. However, if you can make them work, they’ll give you an intense abdominal workout. The dip station will work your pecs, anterior deltoids and triceps. Varying the angle of your dips will also alter the degree to which the various muscles are worked. The more you bend your torso forward, the more you’ll work your pecs. The more upright your torso, the you’ll be involving your triceps. The padded back and arm rests in the leg raise station can be used to do both leg and knee raises, which will give your abdominal muscles a good workout. The platforms below the dip bars will help you get into and out of the leg raise station, and they can also be used for calf-raises. Also, if you have the strength to support your own bodyweight, the dip bars can be used to do vertical leg / knee raises, which will give you a more intense abdominal workout (similar to hanging leg / knee raises). In making this power tower compact, Soozier have had to compromise on the design. It’s a very narrow bodyweight station, which means that it is less stable than some of its competitors (e.g., Stamina 1700). Unless you are fairly light (less than about 150 lbs; 68 kgs), when you’re using the pull up bar and dip bars, you’ll almost certainly feel it wobble. Most multi-station power towers experience this problem; its almost unavoidable. The reason is that equipment like this, which is made primarily for home use, has to be light enough for people to carry into their houses and assemble. Less weight, however, also means less stability. Therefore, you really have to make sure you are using good technique when using the Soozier Power Tower. Try to make sure you are completing controlled movements, and that your body is moving straight up and down (with both dips and pull ups). On that note, this power tower is definitely not suitable for doing either explosive variations on pull ups and dips, or advanced bodyweight exercises like muscle ups and front / back levers. Seriously, if you try these kinds of movements, you risk having it tip over and hurting you or damaging something. The wobble that this machine is likely to have may annoy some people, but you can also look at it in a more positive way. Having some instability in your power tower will actually help you learn to do bodyweight movements in a smooth and controlled fashion. When you can do both pull ups and dips without feeling significant movement in the power tower, you’ll know that you have developed a solid technique. 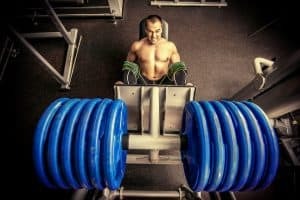 If you are concerned about it wobbling, most power towers benefit from being placed on some protective home gym flooring. This will make the equipment more stable during use, and prevent it from damaging your floors. Alternatively, a couple of sandbags or weight plates (if you have them) placed over the base should lessen the problem. While it may wobble, with a load capacity of 330 lbs (150 kg), this bodyweight station definitely won’t break or bend. That’s largely due to the strength of the frame. Soozier have certainly tried to offset some of the instability by making the frame out of good quality, heavy duty steel. Despite its compact size, it is relatively weighty, tipping the scales at approximately 71 lbs (32 kgs). Unfortunately, the padded back and arm rests and grips don’t quite meet the same standard of strength and quality. 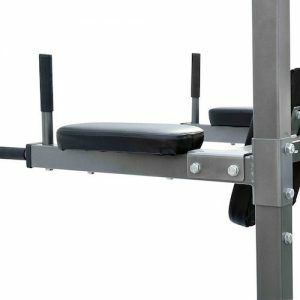 The grips on the dip station, leg raise station and pull up bar are made from a thin rubbery material, which is not all that good. Also, the back and arm rests that support you in the leg raise station are high density foam, but they’re thin and not as comfortable as other power towers. Overall, the Soozier Power Tower trades quality of design for compactness, and although the steel frame is very good, some of the attached parts are not so good. For the most part, the Soozier Power Tower is very straightforward to put together. Although you should always have someone to help you assemble equipment like this, if you have to do it by yourself you’re unlikely to experience much trouble. Altogether, we think you should plan for about 1 – 2 hours to have it completely set up and ready to use. We said ‘for the most part’ because 1) this power tower often seems to be shipped in packaging that is not strong enough to contain it, and 2) the assembly manual is small and difficult to read. The packaging is an issue because if it tears open, which it may, you’ll probably loose some of the nuts, bolts, and / or washers, and you’ll need to take a trip down to the hardware store to replace them. The assembly manual is less of an issue, because this power tower is not very complex, and even those who are not manually inclined should be able to quickly figure out how it goes together. As mentioned, the whole thing weighs about 71 lbs (32 kgs) so it’s definitely a good idea to ask someone to help you move it to the area in which you want to put it together. Also, as with most power towers, you’ll probably want to assemble this one in the space that you’re going to use it. Once assembled, it won’t be easy to get through doorways or up and down stairs, and disassembling and then reassembling it will be a pain. If you have a socket set, this will come in handy. An adjustable wrench is also a must because the included wrenches are a bit small and not especially useful. Leave all of the bolts loose until you have the power tower completely assembled. Once you have it assembled, tighten all of the bolts starting at the bottom and working your way up. If you don’t do this, your power tower may not be level and this will make the instability even worse, especially if you have solid and / or uneven floors (e.g., concrete floors in a basement). This applies to basically all fitness equipment that requires assembly. Overall, the Soozier Power Tower is easy to use. Its solid frame means you’ll be able to get many good workouts from it over a long period of time. 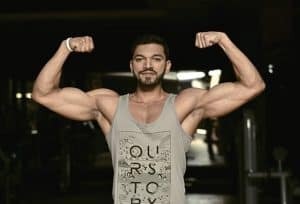 If you have very broad shoulders, you may find that the pull up bar and or dip bars a touch narrow, but most people are unlikely to have any problem with this. 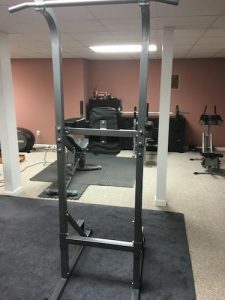 As we’ve mentioned, this power tower isn’t suitable for doing advanced bodyweight movements like muscle-ups or front levers, and it’s certainly not suitable for doing kipping pull ups (i.e., the crossfit style pull ups). If you do controlled pull ups and dips, you should be able to minimise the wobble and instability, however if you’re concerned about this, place some weights or a couple of sandbags on the base. Also, we don’t recommend doing weighted exercises with this machine as, again, it will become less stable. Generally, the Soozier Power Tower sits about middle of the range in terms of price. It’s not the most expensive of multi-station power towers, but its also not the cheapest. The higher price is possibly due to its more heavy duty construction. 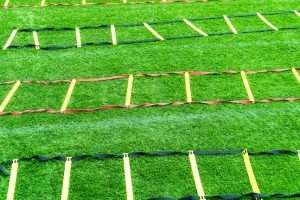 Considering that it’s a very strong piece of equipment, which will help you do a lot of quick and effective bodyweight routines, we think the price you’ll pay is ultimately a sound investment in your health, fitness and physique. However, there are less expensive alternatives out there. Overall, the Soozier Power Tower is not a bad piece of equipment by any means. If you’re looking for a sturdily built and compact machine to go in a small home workout space, then it is definitely worth considering. If, however, you’re just looking for a compact power tower and are not particularly concerned about it being heavy duty, then you may be better off going with the Stamina 1690 Power Tower. It’s much cheaper, and still good quality. If you think the Soozier Power Tower is the one for you, you can check the current price here.